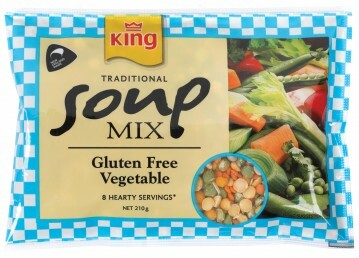 Place the King Soup packet contents in the bottom of a slow cooker add onion, garlic, pumpkin, Moroccan seasoning, raisins, and stock powder. Top with the chicken. Pour over the water. Mix gently to combine. Cover and cook on low for 4 hours. Serve with the topping sprinkled over. Heat the oil in a small frying pan. Add the buckwheat and pumpkin seeds and cook over medium heat until the buckwheat is lightly golden. Remove from the heat and mix in the coriander.